Cactuses, camels, and sand galore! Explore them all with our outdoor activity suggestions, workshops, and crafts! This special tool was created in response to a special request received. 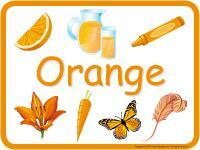 (Open educ-poster-Orange) Print and display to help children identify the color. We have prepared an imaginary game you can enjoy with your group. 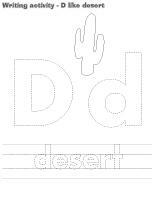 (Open thematic letter-The desert) Print the letter and deposit it in a small box filled with sand. Leave the box in an easy to find location within the daycare so that children can find the letter. Read portions of the letter to them throughout the week. Open four brown paper grocery bags and stick them to the wall to create a large scene at children's eye level. Add glue and sand and let dry. Throughout the theme, add children's crafts to the desert. The pictures may be used as a memory game or to spark a conversation with your group. Use them to decorate your daycare or a specific thematic corner. (Open picture game-The desert) Print, laminate, and store in a Ziploc bag or in your thematic bins. 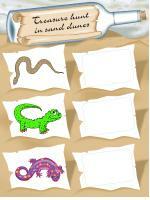 (Open writing activities-D like desert) Print for each child or laminate for use with a dry-erase marker. 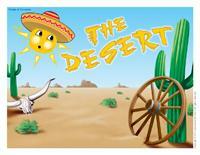 (Open activity sheets-The desert) Print and follow instructions. Provide all your vehicles, particularly all-terrain vehicles which are popular in the desert. Fill a small kiddie pool with sand and let children pretend they are building in the desert. 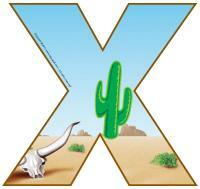 Wild animals or insects which can be found in the desert. Green, beige, or blue cardboard. Pre-cut cactus shapes (or let children cut them if they are old enough). Green poster paint and cactus shapes. Add salt to your poster paint for a "sandy" look! Make your own cactuses using construction paper, empty toilet paper rolls, and your imagination! Sand which can be glued or dyed. Drawing with chalk on sandpaper. A large piece of paper hung on the wall and covered with glue. Children can throw sand on the glue to create a sandstorm. Draw a cactus shape on acetate. Add colourful sand for a stained glass effect. Use contact paper if you prefer. Day and night in the desert painting. Use fluorescent paint for the night. Coloring pages involving animals found in the desert. A tent or a large box (appliance box) can represent a shelter in the desert. A safari habitat: provide beige clothing, a hat, a water bottle or flask, sunglasses, a compass, etc. Colourful robes and/or dresses along with long scarves. Memory game involving illustrations of animals found in the desert or various items found in the desert. Green modeling dough or salt dough (which will harden when left out to dry) and uncooked spaghetti. 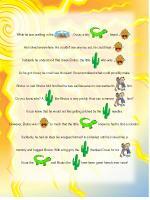 Children can create prickly cactuses! Add fine sand to modeling dough... children will enjoy manipulating the new texture! Stimulation bottles containing sand and plastic snakes or lizards. Books about the desert, animals found in the desert, sand, cactuses, etc. Picture books showing different deserts. Books about Bohemians or Bedouins who guide people through the desert. A map of the world. Where are the deserts? Roadrunner and Coyote book or movie. Words which can be traced. An obstacle course throughout which children must search for cards (illustrations) of items which can be seen in the desert. A container filled with sand. Add plastic cactuses and lizards. A container filled with miniature insects. Cut cucumbers in two lengthwise and give each child a piece. Children plant uncooked spaghetti in them to create cactuses. Observe the cactuses with your group for a few days. The cucumbers will release water. Explain how this is just the opposite of what real cactuses do. Different types of sand can be manipulated and examined with magnifying glasses. A real cactus can be observed and carefully manipulated. A Mexican meal! Cactus decorations are easy to find! (Open picture clue story-The desert) Print. Sit in a circle with your group. Begin reading the picture clue story. When you reach a picture, pause and point to it. Children must guess the missing word. Give each child a hula hoop which will represent his home. Children must act out the instructions you give them. You can, for example, tell them they are taking a walk in the desert (they pretend to walk slowly), that they are thirsty (they can stick out their tongue), that it is very hot (they can pretend to wipe their forehead), etc. When you tell them there is a sandstorm, children must move to a new hula hoop. This game is played like hot potato. Children sit in a circle and pass a cactus (or other object related to the theme) around the circle as quickly as possible (without throwing it) to the sound of music. The child holding the cactus when the music stops is eliminated. He can be in charge of the music for the next round. The game ends when there is only one player left. Tell children a sandstorm is coming in the desert. They must quickly find a hiding place. Once they are all hidden, create a toy storm. Deposit as many toys as possible in the centre of the daycare. You can use a vacuum cleaner to represent a storm sound). When you are done, children can come out of their hiding places and put all the toys in the correct place before another sandstorm arrives. (Open game-Treasure hunt in sand dunes) Print several copies of both the list and the items children must search for. Make sure children recognize the illustrations on the list. With a partner, children search for the items. The first team to successfully collect all the items wins. Play in your sandbox. Explain how, in the desert, there is sand everywhere. Tell children that animals dig holes in the sand and hide in them. Build houses, dunes, etc. Provide trucks and plastic animals. 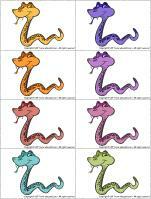 (Open game-Snake) Print and laminate. 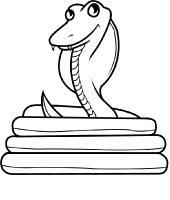 Before children arrive, hide several snakes in your sandbox. When you go outdoors, invite them to search for the snakes. Each time a child finds a snake, encourage him to say "snake". The other children will probably run over to see it! Help children place something heavy on their back (like a backpack) and have them complete an obstacle course, like a camel. Children can walk in the sand, bend down to drink water in an oasis, and lie down at the end of the course... because they are so tired! 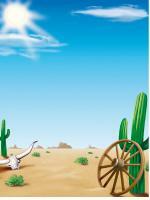 (Open scene-The desert) Print, laminate, and cut out the pieces. Children use the pieces to create desert scenes. Throughout the theme, leave a container filled with sand in a corner of the daycare. Add plastic cactuses, camels, and cars (4x4's), etc. (Open tic-tac-toe-The desert) Print. On a large piece of white cardboard, draw a grid. One child plays with the O's and a second child plays with the X's. They must take turns depositing symbols on the grid. The first child to line up three matching symbols wins. (Open hunt and seek-The desert) Print and laminate. Children pick a card and search for the item in the scene. 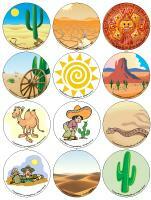 (Open story and memory game-The desert) Print, cut out, and laminate the cards. Place the cards face down on the floor or table. Children pick three cards and invent a story in relation to the illustrations. Variation: Print twice and use as a memory game. (Open snakes and ladders-The desert) Print and laminate. Use a die and plastic insects as playing pieces. Play until all the children have reached the end of the board game. Deposit a variety of objects with different textures on a table (hairbrush, comb, sponge, feather, etc.) Children work with a partner. They take turns rubbing each item on their partner's hand to determine if they are prickly or not so prickly. Use cushions or blankets to create mountains on the floor, just like camel humps. Provide scarves or pieces of fabric children can use to make turbans. They will enjoy sitting on the humps and pretending they are riding a camel in the desert. 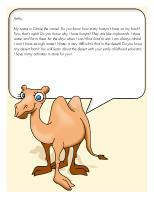 Explain how camels store water in their humps so they can walk in the desert for a very long time, without drinking. Provide a container filled with water and sponges. Show children how the sponges absorb water. Show them how they are heavy once they are full of water and light when they are dry. Just like sponges, camels are heavier when they are full of water. Pour water in a graduated beaker. Draw a line with a dry-erase marker to show the level of the water. Each day, check the water level with your group. 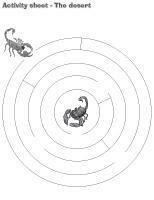 Draw a new line each time the level changes. Explain how water evaporates because of heat, just like in the desert. Purchase a real cactus. Invite children to touch it gently. Purchase dried fruits and vegetables (for soup) and deposit them in a transparent container filled with water. Children can experiment dehydration and rehydration. Set apple and orange slices out to dry. Serve various dried fruits at snack time. Water your plants with your group, explaining why plants need water. Serve each child a tall glass of water to end the activity. Combine the dry ingredients in a pot. Add the liquid ingredients. Mix over low heat until you obtain a homogeneous dough (much like sugar). Cut the end off a cucumber or a potato so that it can stand alone. Encourage children to prick toothpicks in the cucumber or potato to make it look like a cactus. Variation: You may use modeling dough, salt dough, etc. Let dry and paint. Let children draw on a piece of cardboard with glue. When they are done, invite them to pour sand on the glue. This step should be done over a container in order to collect the sand which does not stick to the glue. Variation: You can dye brown or white sand with powdered paint. (Open models-Cactus) Print and cut out. Invite children to trace the model on construction paper. When they are done, they can glue grass, leaves, or any other original material on the shape. Don't forget toothpicks! Variation: For prickly cactuses, paint them green and sprinkle them with salt, sugar, or sand before they are dry. (Open craft-rattlesnake) Print for each child. Have children cut out the shape, color it, and glue it on an empty paper towel roll. Close off one end of the tube with a piece of cardboard and tape. Pour rice into the tube until it is half full. Have children hold it for you while you close off the other end. Children will love shaking their rattlesnake! Combine brown poster paint with a small quantity of water. Using a paintbrush, children let drops of color fall onto a sheet of paper. Have children blow into a drinking straw to disperse the paint and create a desert storm. Deposit a large piece of paper on a table or on the floor. Provide tiny toy trucks (Jeeps) and brown, white, and beige poster paint in aluminum plates. Let children roll the trucks in the paint and then on the paper. Variation: You can sprinkle your mural with sand for an added touch. Have children press their hands or their feet in sand dough. Let dry and paint. 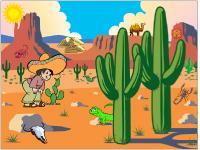 (Open coloring pages theme-The desert) Print for each child.